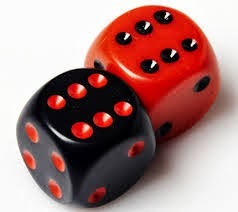 Warhammer is, first and foremost, a dice game. This was emphasised this afternoon when playing a game of warhammer with Jayden Howel (author of the Imperial Patrol and a good friend). It was his first 2400 point game of warhammer, i was using the Three Treeman Wood Elf List and he was using a Gun Line Empire List. If you had asked either of us who would have won, both of us would have said me. I had the honed list, more experience with my list and more experience overall. However victory was not mine. I lost due to some bad deployment choices, unsound tactical moves, but the main reason why i lost was because the diced didn't fall in my favour. And thats the deciding in factor in every game of warhammer. You can have the filthiest with the best tactics, and it can all count for nought if the dice dont fall the way you want them to. There have been times were i have played with 60 glade guard, fired every shooting phased and missed less than 30 times, and there have been games with the same set up where i have hit less than 30. All of this helps make my main point that when playing warhammer, the outcome isn't certain until the game is over. You could have all the odds and probabilities in your favour, but you still have to win the game. And the game this afternoon prove that. I had long since stopped caring about my predictions regarding who would/would not win a game, and now just play game in the moment. But even so i was still surprised when the game started going in Jaydens favour. The whole game served to remind me that 1) The dice decide who wins and 2) No game's outcome is certain before the game has been played. So when facing an opponent who you think will win, play the game, roll the dice and who knows, you may just win. Until next time. Agreed, I mean the odds where so against me (in every way) but in one turn I got all the rolls I needed to turn the game around just like that! Exciting game but that was a huge turn around. Great game though, turns out elves dont like black powder!